The psychosocial needs and experiences of those living with lung cancer have received relatively little attention compared with other cancer types, yet those with lung cancer suffer disproportionately from depression, anxiety, and other symptoms. Because 90% of cases of lung cancer are attributable to personal and controllable health behaviors such as smoking, lung cancer has been considered by many to be a stigmatizing disease. Understanding the degree to which those with lung cancer experience stigmatization is important, because feeling stigmatized or blamed may be linked with treatment noncompliance, avoidance of healthcare providers, or poor quality of life . In this study, we are working to distinguish between related constructs of personal blame, guilt, shame, and stigma in those living with lung cancer and to evaluate the impact of these experiences on psychological adjusment cross-sectionally and over time. We are also partnering with the national Lung Cancer Alliance to build a brief coping-skills training intervention to help those with lung cancer learn to manage personal feelings related to guilt & stigma and stigma-related encounters with friends, acquaintances, and healthcare providers. This study utilizes the Expressive Writing Paradigm popularized by James Pennebaker at the University of Texas, Austin. We are testing how different ways of delivering feedback about participants' writing can influence depth of psychological processing and potential therapeutic benefit in self-guided, Internet-based interventions. The prevalence of clinically-significant distress is as high as 35% among those with a history of cancer. However, fewer than 15% have ever accessed professional or community-based support services. This is unfortunate, because meta-analyses and systematic reviews have consistently documented the efficacy of psychosocial interventions for improving quality of life and reducing symptoms of depression and pain. Although low utilization of psychosocial care is associated with both lack of interest and stigma related to mental health care, other prominent barriers impede access to care: lack of availability of services, distance required to travel to access psychosocial care, poor health status, and cost. Internet-based interventions have the potential to overcome some of these barriers, and early studies suggest potential efficacy. In this study, we are evaluating a second-generation internet-based intervention that includes social-networking components, professional facilitation, and structured, empirically-supported intervention content. This study will evaluate outcomes and both behavioral and linguistic markers of psychological growth among cancer survivors with clinically-significant distress. Recruitment began on July 1, 2008. We are conducting a series of studies looking at computerized text analysis (CTA) programs and how these programs can be used to automate the identification of emotional and cognitive processing in text. These include a study validating CTA programs such as Linguistic Inquiry and Word Count (LIWC), a study identifying instances of benefit-finding in electronic text, and a study that has produced automated, on-the-fly video feedback about levels of emotional expression in written text. Our next sequence of studies is attempting to use natural language processing (NLP) methods to further improve identification of emotional expression. This is a multi-site longitudinal study of individuals recently diagnosed with lung cancer. Across men and women, lung cancer is the most commonly diagnosed cancer in the U.S. and accounts for 29% of all cancer deaths (ACS, 2008). Despite its high incidence and significant rate of morbidity and mortality, psychosocial concerns of lung cancer patients remain poorly understood relative to other cancers (Li & Girgis, 2006). Several large-scale studies of distress in lung cancer patients suggest that lung cancer patients have significant and potentially untreated psychosocial concerns. 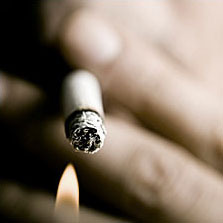 In a cross-sectional comparison of cancer types, Zabora and colleagues (2001) reported that levels of depression, anxiety, and hostility are higher among lung cancer patients than any other cancer type, and clinically significant levels of distress were found in over 43% of lung cancer patients. These findings echo earlier work demonstrating greater levels of physical, social, and psychological problems among lung cancer patients relative to other cancer types (Schag, Ganz Wing, Sim, & Lee, 1994). Because lung cancer is associated with greater levels of distress and quality of life impairments than other cancer types, efforts to identify efficacious and effective treatments to patient-based outcomes in those living with lung cancer are particularly important. We are evaluating the effects of cancer-specific blame and guilt on adjustment to the disease over time, gender differences in coping, and the relationship between supportive care needs and satisfaction with care in this population. We soon hope to begin piloting a telephone and internet-based intervention for addressing unmet supportive care needs. Emoticons are widely used in electronic communications to convey the emotional tone of a text-based message that is otherwise devoid of nonverbal social cues, such as tone of voice, posture, or facial expression. This study will produce a set of emoticons anchored to validated self-report measures of positive and negative affectivity, thereby enabling future researchers to assess emotional states using emoticons that could be embedded in social-networking or other electronically-based discourse media.